The UB College of Law is the first law school in the province of Batangas established in 1949. The opening of the College of Law was a commitment of the institution’s founders to give access to affordable quality legal education to students who do not have the means to pursue a law degree in Manila and realize their dreams of becoming members of the legal profession. From 1949 to 1979, the College of Law produced lawyers who have distinguished themselves in different areas of law. The College closed down in 1979, but re-opened in 1993 sharing the core vision of the University of Batangas “to be a center of excellence committed to serve the broader community through quality education” Government Recognition for the degree Bachelor of Laws was granted by the Commission on Higher Education on April 11, 1997. To the working professionals in the province of Batangas who would not otherwise have the opportunity to obtain a law degree in Manila, the re-opening of UB Law was a step towards the realization of their dreams. As a commitment to continuously improve its quality and service to the community, the College of Law applied for and was granted by the Commission on Higher Education (CHED) the permit to convert its basic law program from Bachelor of Laws to Doctor of Jurisprudence (JD) in 1999. This made the UB College of Law the second school in the country that offers the JD program. In 2001, the Supreme Court approved UB Law’s petition to operate a Legal Aid Office as a facility to provide its students with a Clinical Legal Education program. The program provides a venue for students to apply procedural and substantive law learned in class to actual legal practice under the supervision of a member of the bar. In 2007, Retired Supreme Court Justice Artemio Panganiban cited UB College of Law as one of the five provincial law schools that made significant inroads in surpassing the national passing of the bar examinations in his column in the Philippine Daily Inquirer. In 2010, CHED awarded the UB College of Law with Five Hundred Thousand Pesos for ranking 15th among the top twenty law schools nationwide. The Lipa City campus opened in 2011 with Juris Doctor as one of its program offerings. The opening of a law school in UBLC gave wider access to legal education in the province of Batangas. In 2015, the Legal Education Board granted recognition to the UBLC JD program allowing the College to confer the degree Juris Doctor to students who successfully complete the requirements of the program. Similarly in 2012, the Batangas Campus shifted from Doctor of Jurisprudence to the Juris Doctor Program adopting the same program as the Lipa Campus. A defining moment for UB Law was the results of the 2013 bar examinations where 2013 class valedictorian Rudy V. Ortea ranked third with an average of 84.42%. Atty. Ortea’s achievement was replicated in 2016 with Nia Rachelle Mendoza-Gonzales making it to 9th place. Even more impressive was Atty. Gonzales’ perfect score of 100% in Remedial Law, a subject most dreaded by bar examinees. 1. Provide unparalleled legal education in the Southern Tagalog region. 2. To assist law students in the development of their mental faculties so they can better appreciate the intricacies of the law and prepare them for the bar examinations and competitive legal practice in the future. The College of Law provides students with a creative learning environment that rigidly prepares them for the bar examinations and competitive future law practice. Instruction is thorough and tough. From their first day of school, students are taught to think, speak and write like lawyers. They are trained under the “Socratic” method of instruction – an approach where the professor continually probe questions on the students to explore their knowledge of the basic legal tenets and applicable jurisprudence. Regular class recitations are supplemented with lectures on the fine and conflicting points of the law. This method has proved to be effective in developing the critical-analytical thinking ability and communication skills of students necessary for good advocacy. For the students, the experience is unparalleled. Outside the classroom, co-curricular activities become part of the students’ academic and social life. The Clinical Legal Education Program expose students to practical legal work situations that provide them with an expanded understanding of the law, legal theories and rules of procedure. Regular publica-tion of the. Law Journal, debate and moot court competitions allow them to pursue their interest and harness their skills in writing, research and oral advo-cacy. These activities develop the competitive spirit among students, yet create a collegial atmosphere with friendship borne from learning and working with each other. Juris Doctor Program The Juris Doctor program provides students with an enriched curriculum covering core bar subjects, elective courses and preparation of thesis requiring them to explore different aspects of the law and the legal system. 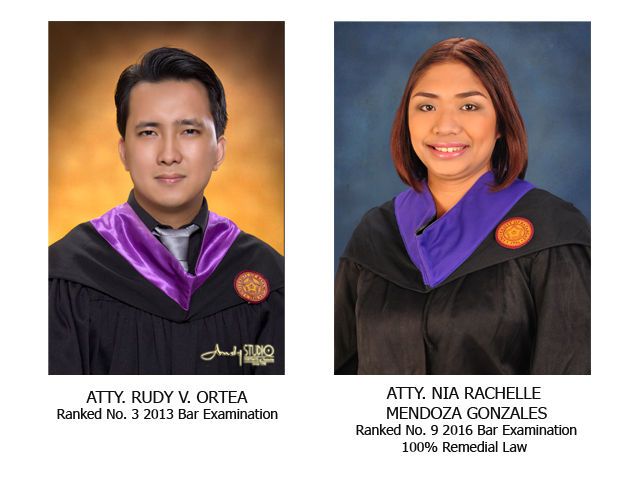 UB Law has produced two bar topnotcers. In the November 2016 examinations, JD Class Valedictorian, ATTY. NIA RACHELLE MENDOZA GONZALES ranked No. 9 among the 6344 candidates with the College posting an 80% passing rate over the 59.06% national passing percentage for the same year. In 2013, JD class valedictorian, ATTY. RUDY V. ORTEA ranked third (3rd) among 5293 examinees. 3. Pass the interview conductd by the Dean of the College. Transfer applicants must pass the written qualifying examination and interview. UB LAW JOURNAL The UB Law Journal is at the forefront of legal scholarship in the College of Law. Completely managed by the students, the law journal publishes articles written on various issues of law with emphasis on current development, digest of recent jurisprudence and updates and commentaries on recent legislation. Completely managed by the students, the Law Journal provides a venue for students to harness their skills in legal research, writing and editing. Freshmen students who graduated with honors and have availed of entrance scholarship become members of the Law Journal. MOOT COURT AND DEBATE SOCIETY The Moot Court and Debate Society (MCDS) was organized to expose its members to high level competitions that develop their skills in research, critical thinking and argumentation. Participants to the national moot court and debate competitions are carefully selected from the members of the MCDSby the advisers based on their performance in class. Retention of membership is determined by the members academic standing in the previous semester. LAW STUDENT COUNCIL The UB Law Council is composed of members elected by the student body annually. It is the representative structure of the students with the main purpose of promoting the general welfare of the student body. The law council spearheads the bar operations and other social activities of the College. To facilitate smooth transition election of law council officers for the ensuing academic year shall be held before the end of the second semester.